Burger Night is one of my favorite food nights because it involves a variety of toppings. Which means that no Burger Night is ever the same. I thought I’d put together a little guide to Burger Night, so that you can enjoy one of your own! Step 2: Form your ground meat into whatever size burgers you desire. We usually do quarter pound burgers for grilling’s sake, but we’ve done half pounders too and let me tell you: they are biiiiiiig. You could add some spices to your burgers at this point if you wanted. Step 3: Grill ’em up! 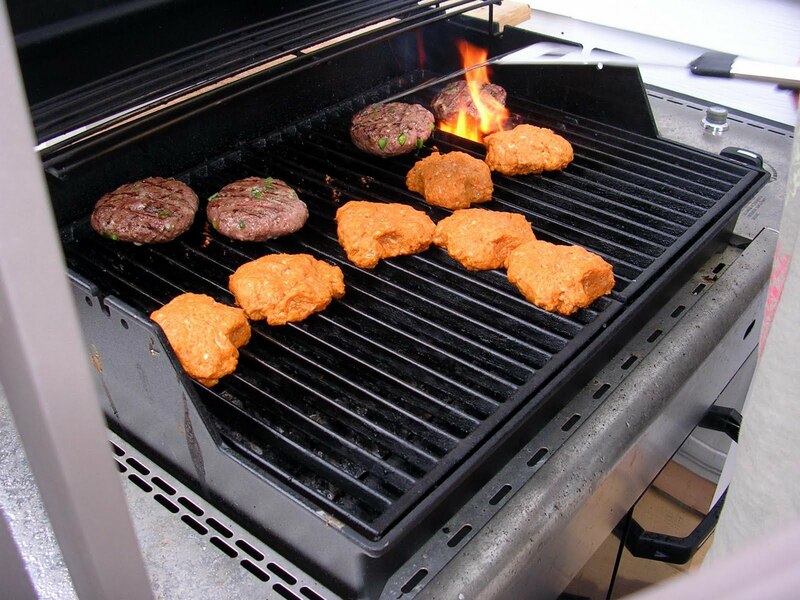 Make sure not to start a grease fire…we did that once. We had a burger inferno on our hands….since then, I’ve learned to buy leaner ground beef…and to make M do all of the grilling. Step 4: While your meats a grillin’, prepare your toppings and sides. Step 5: Top your burger. Step 6: Eat it. Fork and knife are optional. We had sautéed dinosaur kale and baked sweet potatoes with our burgers. My favorites! I learned how to saute vegetables in chicken broth without oil at the Whole Foods Store Tour. SO cool. AND delicious: the broth really adds a comforting flavor to the veggies…if that makes sense.